Please use a Minutesteak to get the best result. Cut or slice the beef into a thinly rectangular shape. Blend all ingredients for the paste in a blender or kitchen aid until smooth. 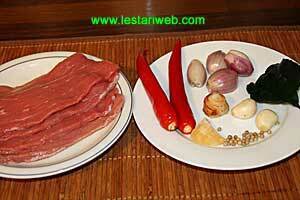 Heat 2 tbsp oil in a frying pan, stir-fry the beef, paste and kaffir lime leaf until the beef is half cooked. 4 Add salt and pepper to taste. 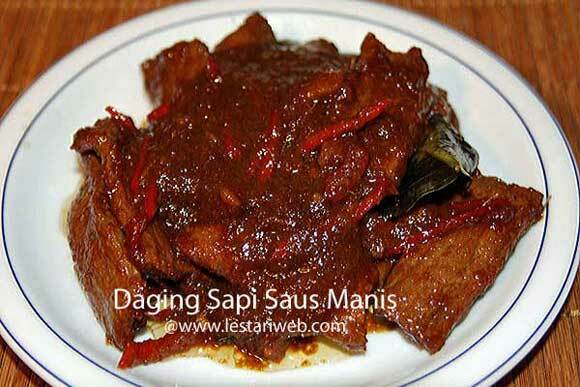 Add kecap manis, then pour in about 100 - 200 ml broth or water. 5 Turn the heat into medium & simmer until the water becomes thick and completely absorbed by the meat. 6Serve hot right away with rice or potato and salad.